I have try the suggestions, i have update the bios, change the wlan card but nothing work. Did you uninstall the MSI /OEM trackpad driver and reboot, update to the generic trackpad driver, and reboot? I have uninstall the synaptics in the program (i don't have trackpad in the list), i have reboot, but the same problem. Where i can update to the generic trackad driver ? Hi guys, my MSI GE63VR with a GTX1070 has lag when I right-click on the desktop, but I noticed that if I open nVidia GeForce experience app the lag disappears... wtf? If I have it open or minimized there's no lag, but if I close it, the lag is here again... Any ideas? Running Windows Update is how people usually do it, or you can check your System Device Manger interface to see what needs driver / firmware - the little Yellow Flag points them out - then right click and select update, select option for online Windows update. Because the microstutter is caused by a bug in Optimus, when the Nvidia Control panel is open it activates the dGPU and the microstutters are gone. hmscott, Kevin@GenTechPC and dvgcadete like this. 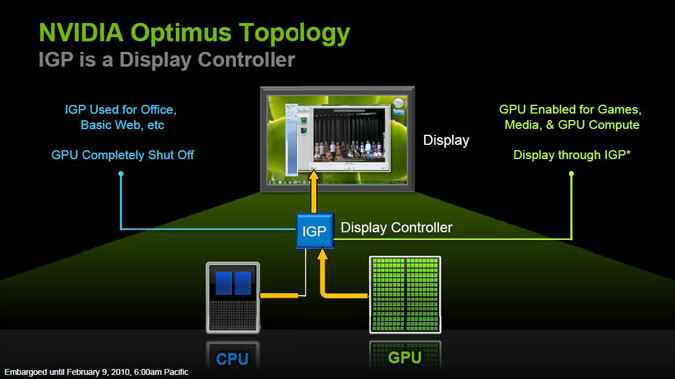 Optimus is like this picture below, it's using IGP as the primary display therefore all data from dGPU will have go through it and that's why you get some stuttering issue. If you output directly from the dGPU through DisplayPort (when applicable) then you can bypass Optimus and free yourself from that issue. hmscott and Vistar Shook like this. Wasn't there some other app or systray tool to do this? Keep dGPU loaded to not let it drop in and out into iGPU mode? Friend's don't let Friends buy Optimus. Didn't many of the manufacturers stopped making systems with Optimus? It's probably a thing of the past now. The higher up in dGPU power the less likely you have Optimus, and instead get "switchable" iGPU / dGPU, like in the MSI Gaming laptop models. And, even so, MSI has also dropped "switchable" and had only dGPU in a number of models. The GT80's had "switchable" iGPU / dGPU, but the GT80S and above have dropped that. It's actually not a bad thing to have, switchable GPU paths, but in reality for those huge laptops, the battery is so small, like 56whr anyway, that its still not a big improvement. I think I got 3 hours 15 minutes iGPU instead of 2 hours 30 minutes with dGPU, but there could be a time it's helpful. With the arrival of improving onboard iGPU performance, like the AMD Vega / Polaris on the Intel G models, and of course the AMD CPU's, matrix switchable iGPU / dGPU might make a come back of sorts, maybe in a new form better than Optimus or Matrix Switchable alone. The GT80 I had had an Intel 5950HQ with an extra 128MB L4 Cache that the iGPU could use to vastly improve performance, but it was still such a poor gaming GPU it really was useless for on battery gaming. But, it did make running browsers, streaming movies, and playing back DVD / Blu-ray better. Maybe with the 8950HK Intel will bring back the iGPU EDRAM... no word yet from Intel why they went with an 8950HK name instead of an 8820HK name. Phoenix pointed out the new intel graphics drivers that addresses the optimus bug (microstutters/lag) for FCU. Maleko48, Killer_Networking, Ultra Male and 2 others like this.